Welcome to Romania! How about finding out some important tips about traveling in this country before actually arriving here? Of course these tips remain valid also for the ones that have already arrived! First of all, basic rules: driver seat is on the left side of the car (UK drivers pay attention! :) ), no cell phones while driving (hands free is allowed), driving with your lights on might help you to decrease the possibility of being stopped by the police, seat beld always on as for the driver and its passengers (pregnant women are exception to the rule). Always make sure that you have signalized your intention to make a right or left with 50 m (in the city) and 100 m (outside the city) before actually making the maneuver. This helps your driving mates to see your intention and to avoid crashing into you. Road tax: When you rent a car in Romania, please check that the rent a car company also provides you Rovigneta which proves that for the rented car, the road tax for driving inside Romania has been already paid. If not, you can buy this insurance from any gas station on your way. Attention! If you do not show this proof to the police, you will for sure have to pay a ticket of around 150 Euros. Mamaia: If you are heading for the seaside, in Mamaia, you will have to pay upon every entry inside this seaside city a tax of 15 RON (about 3 Euros and 50 cents). This is paid only for the summer season 15 June - 15 September. You can always make a pass if you are forced to return every day here. Cernavoda bridge: If you have to pass the Cernavoda bridge, on your way to Constanta or the seaside, please be aware that there is a tax of 10 Ron (about 2 Euros and 50 cents) for small vehicles. This is paid only once. Speed limit: If you are a speed fan, please consider that in Romania these are the speed regulations: 50km/h in small villages, 60km/h in the city, 100km/h on country roads and 120km/h on national roads (marked as DN) and European roads (E), as well as highways (A). If the police stops you when driving with more than 50 km/h over the legal speed, they can retain your driving license and for sure, you will also receive a ticket of about 50 Euros. 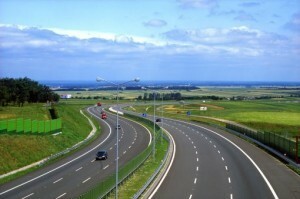 And let us not talk about your safety which is the most important aspect of your trip to Romania. 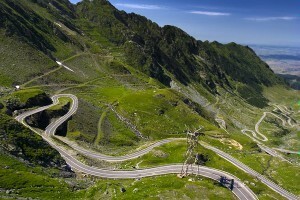 Drive safe and slow because the sights are beautiful and Romanian roads are not quite built to serve as tracks. Take a look at the this picture, what more can we say? You would wish to drive the car with 30 km/h in order to capture the immense beauty of this place, but be sure that if you drive like a snail, you will only hear swearing from the bottom to the top! Travel tips: As a foreign tourist you will have to put in your luggage right before leaving home several memory cards for your camera and lots and lots of batteries because you will be surprised to find out that the diversity of this country will offer you at every 5 minutes a different attraction that must be immortalized and well kept in your trip journal. Patience and a big empty stomach are the best travel advices: it takes patience and time to discover every corner of the amazing sights of the country, and an empty stomach with a bigger appetite in order to taste all the Eco products (if you are heading for the villages in Transilvania or Maramures as well as different other regions in the country), or rich meals with good wine, all made inside the household. We could go on and on but it would be interesting to hear all the questions that might cross you mind! In vacanta cu "rent a car"
De ce ar trebui sa vizitez orasul Sibiu?